The 31-year-old tennis star could be forced into retirement because of hip problems. Andy Murray is still hoping to make it to one more Wimbledon tournament before his problematic hip forces him into retirement. For now, he's only committing to the Australian Open. 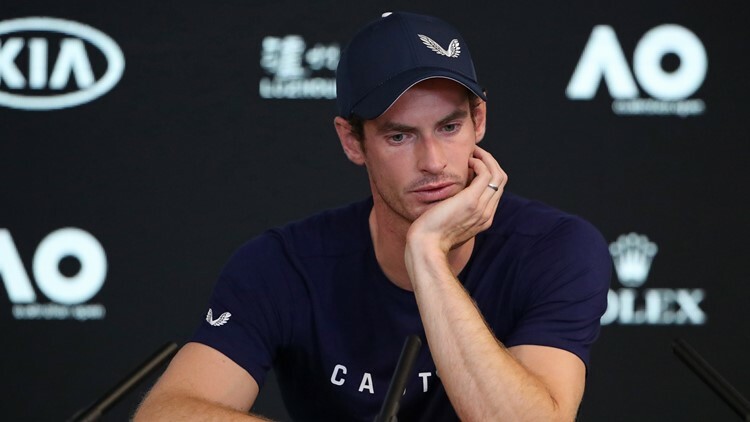 In an emotional news conference Friday, when a tearful Murray had to leave the room shortly after his first attempt to get it started, and needed to pause several times to compose himself once it had resumed, he confirmed he'd play his first-round match at the Australian Open next week but wasn't sure how much longer he could continue beyond that. The 31-year-old Murray said he practiced in the off-season with the main goal of making one last run at Wimbledon, where he ended the 77-year drought for British men with his title in 2013, but now wasn't sure he'd make it that far. "I can still play to a level — not a level I'm happy playing at," he said. "But also, it's not just that. The pain is too much really. "I don't want to continue playing that way. I tried pretty much everything that I could to get it right — that hasn't worked." The three-time Grand Slam champion is scheduled to open against No. 22-ranked Roberto Bautista Agut at Melbourne Park, where the season-opening major begins Monday. He has reached the final five times at the Australian Open but never won the title. Getting through the first round will be a major achievement in 2019 for the former No. 1-ranked Murray, who has slumped to No. 230 after playing just 12 matches last year following surgery on his right hip in January. He opened this season last week at the Brisbane International, where he won his opening match against James Duckworth but lost in the second round to Daniil Medvedev, showing visible signs of limping between points and struggling to move freely around court. He had an incomplete practice match against long-time friend and top-ranked Novak Djokovic on Thursday at Melbourne Park, but only won two games. Andy Murray of Great Britain speaks during a press conference ahead of the 2019 Australian Open at Melbourne Park on January 11, 2019 in Melbourne, Australia. Murray has had a celebrated career, breaking long Grand Slam droughts for British men when he won the U.S. Open in 2012 and at Wimbledon the following year — when he was the first British man since Fred Perry in 1936 to win the prestigious lawn tennis title. He also became the only player to win consecutive singles gold medals at the Olympics when he won at London in 2012 and Rio in 2016. Long considered part of the so-called Big Four in men's tennis with Roger Federer, Rafael Nadal and Novak Djokovic, Murray likely will be the youngest of them to retire after 20 months of trying to deal with his painful hip. At 37, Federer is in Australia attempting to win the title for the third consecutive year and for a seventh time overall. At 31, top-ranked Djokovic is at Melbourne Park also trying to win a seventh Australian title. The 32-year-old Nadal is ranked No. 2 and confident of extending his career for several years. Murray has been preparing for the 2019 season knowing that his career could be over within months. In his training program last month, he told his support group that the pain was becoming too much and that he needed to set a date for retirement. "I spoke to my team and I told them I can't keep doing this, that I needed to have an end point because (I was) sort of playing with no idea when the pain was going to stop," he told the news conference Friday. "I said to my team 'I think I can get through to Wimbledon' ... that's where I would like to stop — stop playing." Murray added, becoming tearful again, "But I'm also not certain I'm able to do that. "I'm not sure I'm able to play through the pain for another four of five months." Players and coaches around the world rallied around Murray . Juan Martin del Potro, who has struggled with injuries throughout his career, posted a message on Twitter expressing his support: "Andy, just watched your conference. Please don't stop trying. Keep fighting ... You deserve to retire on your own terms." Commentator Darren Cahill praised his contribution to the sport , as did fellow playerGrigor Dimitrov. Murray said he's considering another hip operation, more to improve his quality of life than as a way of returning to the top level in tennis. "I have the option to have another operation, which is a little bit more severe than what I've had before — having my hip resurfaced," he said. "That's something that I'm seriously considering right now. Some athletes have had that and have gone back to competing (but) the reason for having an operation like that is not to return to professional sports, you know, it's just for a better quality of life." Murray said he'd spoken extensively to long-time doubles star Bob Bryan about recovering from a similar operation, but couldn't see himself recovering to be fit enough for singles and he wasn't considering transitioning to doubles. "I have a severely damaged right hip," he said. "Obviously you see me running around a tennis court, walking in between points, and obviously I know it doesn't' look good ... look comfortable. "But there's little things, day-to-day, that are also a struggle. It would be nice to be able to do them without any pain: putting shoes on, socks on, thinks like that. That's the main reason for doing it."